RECHARGEABLE- Large capacity 1800 mAh battery lasts up to 50 hours on a single charge (on low setting) or 12 hours (on high setting). Includes long 6.5-foot USB cable and wall plug for charging or power source. Easy access power switch on the base controls 2 brightness levels. MULTI-FUNCTIONAL- Flexible gooseneck and strong padded clip allows you to clip onto music stands, pianos, books, desks, headboards, and crafting tables. Can also sit freestanding on the base. 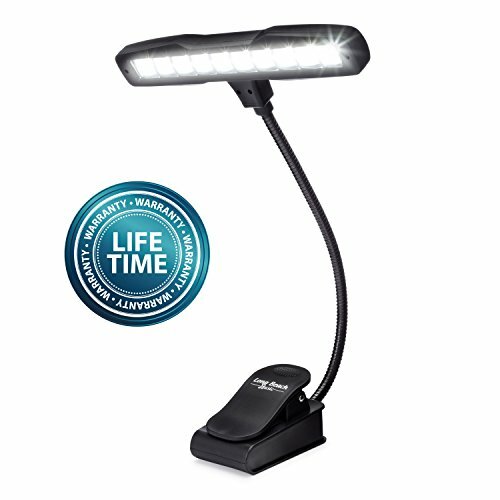 WIDE LIGHTING AREA- 10-LED, 100-Lumen light head spans 8 inches wide, can illuminate up to 4 pages of music! LIGHTWEIGHT / PORTABLE- Weighs only 8 ounces, includes handy carrying bag for traveling. LIFETIME WARRANTY- We stand behind our products 100%. If you ever have an issue, we will replace your light! -Sturdy padded clip opens up to 1 inch. Attaches to music stand or sits freestanding.